Can Charcoal Toothpaste Really Whiten Teeth? Charcoal Toothpaste: Yea or Nay? There are countless teeth whitening fads trending on social media these days. From over-the-counter teeth whitening gels to do-it-yourself home recipes to USB-cord gadgets, it can be a little mind-boggling. Perhaps one of the most popular trends is charcoal. That’s right: charcoal. There are charcoal toothpastes, charcoal tooth powders, and make-your-own charcoal toothpaste with activated charcoal capsules and water. The main reason people are choosing charcoal products is for their supposed teeth whitening ability. Charcoal is well known for its ability to absorb things, which is why it is used in water filters. Supporters of charcoal teeth whitening claim that it can absorb bacteria and stains from the teeth. Some people may notice an initial whitening effect from using a charcoal product. This effect can be explained by understanding the difference between whitening and polishing. There are two separate processes which can make teeth appear whiter in color: 1) whitening and 2) polishing. True teeth whitening, also called bleaching, involves a chemical reaction with a peroxide compound. Either hydrogen peroxide or carbamide peroxide gel directly contacts the teeth. It penetrates the enamel to oxidize underlying dark organic molecules, breaking them down into smaller, lighter molecules. This process whitens the overall color of teeth. Polishing is a mechanical process of using abrasive particles to remove superficial stains from the enamel surface. Every time your dental hygienist cleans your teeth, she finishes by polishing them with a gritty paste. This polishing often makes the teeth look whiter. This is also the mechanism of whitening toothpastes. They contain added abrasive particles that scrub away surface stains. The danger lies in substances that may be too abrasive and scrub away some of your enamel with the stains. Which Category does Charcoal Fall Into? Charcoal products do not cause the chemical reaction required to break down those dark organic molecules, so they are not a tooth whitener. Depending on their abrasiveness, they may polish away some surface stains. They claim to whiten by absorbing stains. This claim is questionable; it does not have support in scientific research at this time. The Journal of the American Dental Association published a systematic literature review of charcoal and charcoal-based toothpastes. They studied all of the scientific studies conducted on charcoal and charcoal-based toothpastes to determine a few things: whether or not they were effective at cleaning the teeth, and whether or not they could damage the teeth. Some studies showed a reduced risk for cavities from using charcoal. Some showed significant enamel damage. They also posed the interesting question as to whether or not the charcoal’s absorptive properties would inactivate fluoride (which is a well known cavity-fighter). The conclusion of the literature review is that there is not enough scientific evidence showing charcoal’s effectiveness in cleaning teeth and its safety. 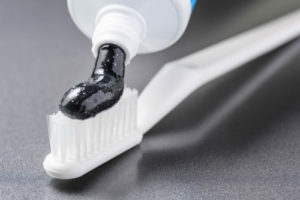 Simply put, they could not prove that charcoal toothpastes do what they claim to do (reduce the risk for cavities and gum disease), and they could not prove that it is perfectly safe to use. Under that conclusion, Dr. Ann and Dr. Lauren cannot recommend that any of their patients regularly use activated charcoal or any charcoal-based product until further research is conducted. So What Kind of Toothpaste Should You Use? To be safe, stick with toothpastes showing the American Dental Association’s Seal of Approval. If you need to polish the surface stains that result from habitual coffee, tea or red wine drinking, opt for a whitening toothpaste. You can add an electric toothbrush for extra polishing power. If your teeth are sensitive, avoid whitening toothpastes. The abrasive content could irritate your already-hypersensitive teeth. For sensitive teeth, we recommend Sensodyne or a prescription fluoride toothpaste. If you have a high risk for cavities, choose an over-the-counter fluoride toothpaste or ask Dr. Ann and Dr. Lauren for a prescription fluoride toothpaste. Do You Have More Questions about Whitening Toothpastes? Call us today at 281-667-4010 to schedule a consultation with Dr. Ann and Dr. Lauren. They will address any questions you have concerning activated charcoal, charcoal toothpastes, and any other whitening trend you may have seen on social media lately.